I read this article and found it very interesting, thought it might be something for you. The article is called Brand New Retro: Dalymount Park and is located at https://www.totallydublin.ie/more/brand-new-retro-dalymount-park/. When Dublin City Council unveiled plans in 2016 to redevelop the dilapidating Dalymount Park, Bohemian FC urged their fans to support the proposal. According to the club, the plans represented a best-case scenario not just for Bohs but also for “football in Ireland, the City of Dublin and our local communities for generations to come.” The club statement added, “Dalymount has played a unique part, chiefly in the sporting, but also in the political, musical and cultural history of this city and country.” And it’s true. Years before Croke Park, Marlay Park or the Phoenix Park, Dalymount was the only venue hosting major concerts. It all started in 1977. The Beach Boys, Dr. Feelgood and John Peel were set to play on the August Bank Holiday Monday. 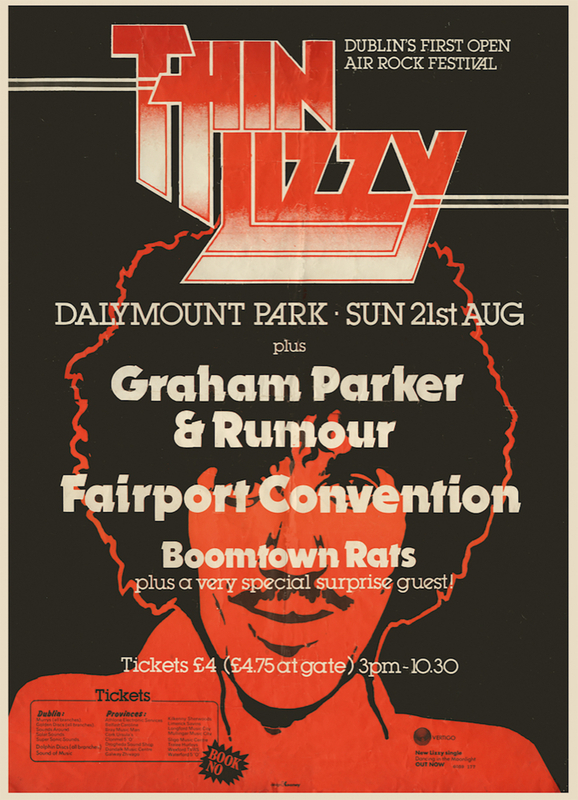 But with just two weeks to go, the gig was canceled, with promoter Pat Murphy focusing on his other Dalymount project: Thin Lizzy headlining “Dublin’s First Major Open Air Rock Festival” on August 21. The line-up included two upcoming new wave Dublin bands, The Boomtown Rats and The Radiators from Space. Bob Geldof, of course, relished the opportunity and his energetic stage performance made an impact. (The Rats made their Top of the Pops debut the following Thursday.) It was Thin Lizzy that the crowd was there for. And Phil Lynott, who just turned 28 the day before, delivered. Spotted among the crowd of 11,000 was a man who still occasionally visits Dalymount for Bohs games, Michael D Higgins. Aged 36 and not yet in the Dáil, I wonder was our president on the guest list? Did he buy his £4 ticket in advance, or pay his £4.75 cash at the gate? In July 1980, Bob Marley and the Wailers played a two-hour set in front of around 10,000, and its success led to Pat Egan promoting more Dalymount gigs in the 1980s. In 1981 he booked the Specials and the Beat, but just two weeks before the gig and with Ghost Town top of the charts, the Specials canceled. Their management blamed the “unsettled security situation” in Ireland but the reality was the Specials themselves were unsettled and the group split a few weeks later. 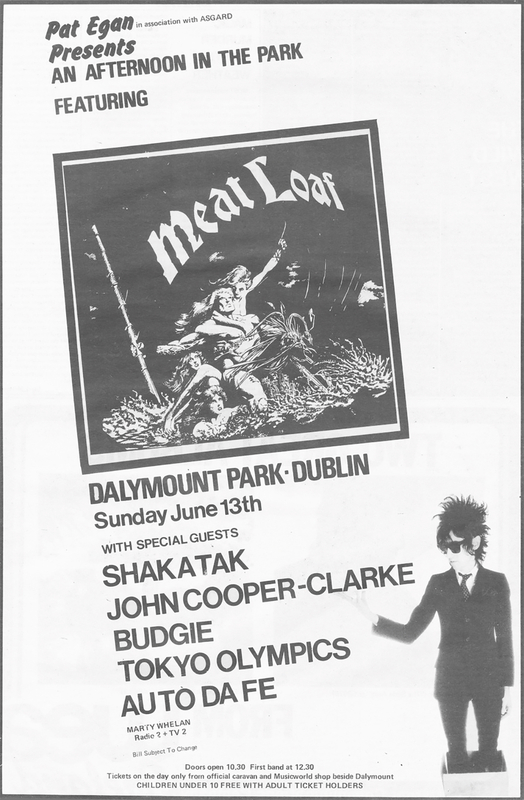 The strangest mix of acts gathered in June 1982 when MC Marty Whelan introduced Meatloaf, Shakatak and John Cooper Clarke. But the following year in August 1983, it was all Heavy Metal. About 5,000 people, most clad in leather and denim, attended the Garden Party festival. Amp volume was turned up to eleven as Black Sabbath, Motörhead, Twisted Sister and Mama’s Boys drowned Dublin 7 in a wall of sound. 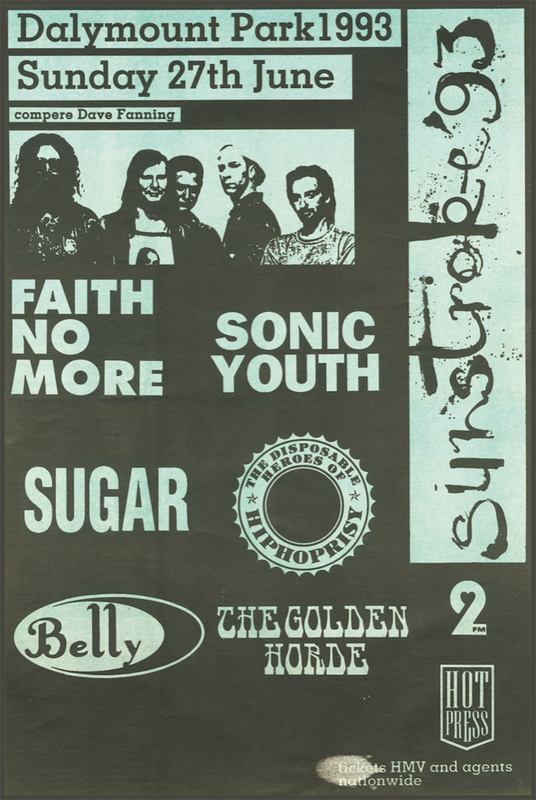 Ten years later and MCD promotions took their alternative grungy Sunstroke festival to Dalymount in June of 1993. Faith No More headlined a cast of mainly American alternative bands. MCD ran Sunstroke again in 1994 with 15,000 people attending. The Red Hot Chilli Peppers headlined, which means they are the last group to have played at a Dalymount festival. It could have been Destiny’s Child though. They were due to headline the Jam in the Park festival in June 2001, but this was canceled because of crowd safety concerns less than 2 weeks before the show. In a few years time, when the newly remodeled and redeveloped Dalymount opens, here’s hoping the tradition of hosting music events is restored. Someone should see about booking Edie Brickell and her band!